Enjoy big sound without cables with the JBL E65BTNC Bluetooth Over-Ear, Noise-Canceling Headphones in blue. 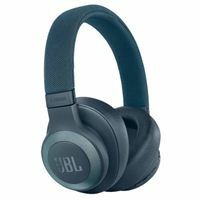 These headphones connect to your mobile device using Bluetooth 4.1 and sport 40mm drivers, which deliver a frequency response from 20 Hz to 20 kHz with 32 Ohms of impedance. Active noise cancellation filters out external sounds for a more immersive experience.